Apple’s new video-editing app seems to be off to a tentative start, reaching almost a million downloads within four days of its release but failing to crack the iOS app store’s top 20. Aimed primarily at the Instagram and Snapchat crowd, Clips went live on April 6 for Apple’s mobile devices and quickly entered the iOS app charts’ top 50. But despite Apple’s promotion of the new app via its prominence on the tech giant’s online store, the app has so far only managed to reach as high as 28 in the chart. It’s since slipped to 53. Data shared by apps analytics firm App Annie with TechCrunch confirmed that Clips had received between 500,000 and 1,000,000 downloads from Thursday through Sunday. App Annie’s Danielle Levitas said that despite Apple’s marketing efforts, it’s likely that the “average user” still hasn’t heard of it, though she expects that will all change as users begin sharing their Clips videos on social media sites like Instagram and Facebook. 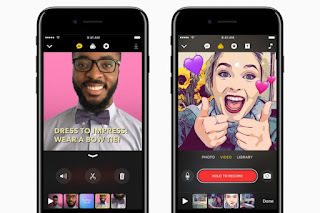 The free app, which currently has an average four-star rating from users, has been pitched as a fun way to create entertaining videos, with ease of use at its heart. In other words, when you use Clips, you’ll see no “timelines, tracks, or complicated editing tools,” as Apple says of the app. With Clips you can easily import video sequences and photos already on your device, or alternatively record completely fresh material. The app features filters, soundtracks, speech bubbles, and emoji overlays to jazz up your work. A neat touch is Live Titles, which lets you add animated title cards or captions simply by speaking into your mobile device’s microphone. The software changes your spoken word into written text, which you can then incorporate into your clip.